Royal Caribbean International’s Mariner of the Seas has undergone an extensive $90 million makeover before kicking off quick Bahamas getaways from Port of Miami in June 2018. The 3- and 4-night Bahamas cruises call on Nassau and CocoCay, Royal Caribbean’s private island destination. The makeover will bring new high-tech thrills, nightlife, and culinary experiences to the newly enhanced ship. Thrill-seekers won’t want to miss Sky Pad, a brand-new virtual reality, bungee trampoline experience. Participants will strap in and put on their virtual reality headset which transports them to another time and planet to bounce over moon craters or compete in intergalactic games. The out-of-this-world experience is for guests of all ages and can be enjoyed without virtual reality headsets for those who prefer to look out over the ocean. 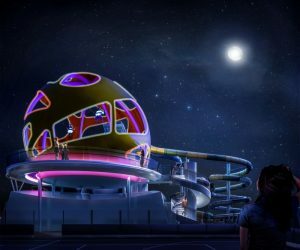 Other shipboard additions will include The Perfect Storm, a duo of racing water slides called Cyclone and Typhoon; a glow-in-the-dark laser tag experience in Studio B; and Puzzle Break: The Observatorium, a new escape room experience where competitors work together to solve a series of high-tech riddles to unravel a mystery. 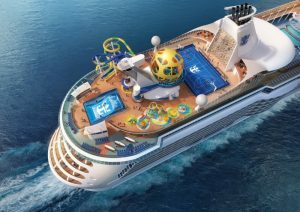 Another added Royal Caribbean-favorite will be the new 40-foot-long FlowRider surf simulator. Besides these new onboard activities, fresh nightlife will include an all-new Polynesian-themed watering hole found only on Mariner of the Seas. The retro lounge will feature tiki-chic décor and guests can choose their favorite specialty handcrafted cocktails. For sports fans, Playmakers Sports Bar & Arcade will be the place to be on game nights for the biggest live sporting events over cold brews, wings, sliders, and more. New dining venues on Mariner of the Seas will include Jamie’s Italian, which offers Chef Jamie Oliver’s rustic Italian dishes made with fresh, seasonal ingredients; Izumi Hibachi & Sushi for exotic made-to-order hot and cold dishes á la carte; and a Starbucks at sea. The 15-guest deck Mariner of the Seas will continue to offer signature Royal Caribbean experiences including a Studio B ice-skating rink, a 40-foot rock-climbing wall, a nine-hole miniature golf course, three pools, a full-sized basketball court, and “Dive-In” outdoor movie nights poolside. We at Getaway Dreams Come True Travel will assist you in crafting your lifetime memories cruise or vacation. To schedule your Vacation Planning Session, please call 724.752.2655.